Perma Multi Plast is a unique admixture based on complex polymeric chemical structure which works wonderfully with all grades of concrete in all weather conditions. The Perma Multi Plast imparts high compressive tensile and flexural strength to the concrete. This Perma Multi Plast admixture is of immense use in making the concrete highly workable and in retaining the workability over long hours. We are known as the most trusted Perma Multi Plast Manufacturer, Exporter and Supplier in the market. Perma : Multi Plast is recommended in all type of concrete. Perma : Multi Plast is recommended in hot weather concreting where workability retention over long periods is required. Perma : Multi Plast is also recommended where very high initial and ultimate strengths are expected. Multi plasticizing action of this product produces free flowing concrete, with most kinds of aggregates and varying fine aggregates. Perma : Multi Plast maintains the workability over long periods. 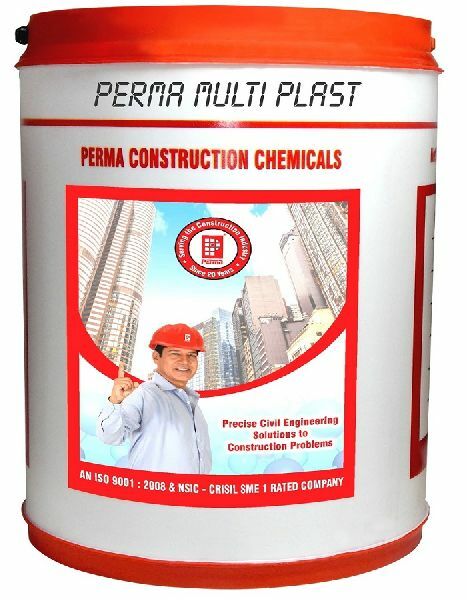 Perma : Multi Plast is specially suggested in all high strength concrete. Direction for use : Mix the admixture with water in the given proportions and dose at the rate 0.5 % to 2% by weight of cement of the diluted material. The dosing of the admixture is done along with the dosing water in the mixture drum. Addition of admixture to the dry cement should be avoided. Should the need arise, to maintain the work ability over long hours an additional dosage of admixture can be added to the concrete before the effect of the previous dosage wears off. Health and Safety : Perma-Multi Plast is not a health hazard or fire risk. Spillages should be washed immediately to avoid possibilities of slipping. Packing : Perma âï¿½ï¿½ Multi Plast is available only in 30 kg drum. Bulk packing could be considered on special request. Qualtiy Assurance : All âï¿½ï¿½PERMAâï¿½ï¿½ branded products are manufactured under strict quality control supervision as per exact manufacturing specifications. Should you find the behaviour of the product varying from the claims in the data sheets please stop the use of the product and contact Perma staff or Distributor. Statement of Presponsibility : Perma branded products when used in accordance with the current published directions for use, perform as per their data sheets / catalogues. The manufacturer and the Distributor will not be responsible for other materials and conditions of inferior workmanship.